Its a great pleasure for me to receive you today for this event. 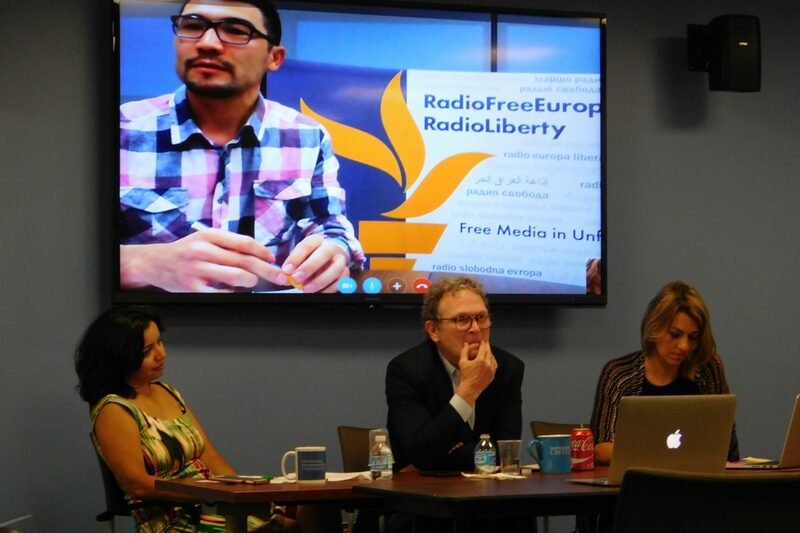 We are organizing it in partnership with our friends and colleagues from Radio Free Europe/Radio Liberty, so thanks to Mohammad Tahir who helped us organize the event. We decided to do that because, as you know, we are one year after the beginning of the presidency of Shavkat Mirziyoyev. He became Interim President of Uzbekistan September 8th last year. So it has been now one year and two weeks, and we thought it would be a great moment to look back at what happened in Uzbekistan during that last year. Relatively important changes are on the way and so we will be discussing that. I think it’s really important to now be able to follow what is happening in Uzbekistan because the country has been relatively closed for all these years and now we have way to interact and get more information about things going on in the country. And of course it’s a critical country, both for strategic issues but also because it’s a demographic powerhouse of Central Asia. Every other Central Asian is an Uzbek citizen so it’s really important to follow what is happening here and there. And so we have three great speakers who will be discussing that. First will be Alisher Sidiq who is the Head of Radio Free Europe/Radio Liberty Uzbek Service. He wasn’t able to join us but he will be with us on Skype so thank you so much, Alisher, for making it. I know it’s late for you already. And then we will have Sean Roberts, who is Professor here at GW working on international development in Central Asia and who has been in Uzbekistan these last few months. And our third speaker will be Navbahor Imamova, the Representative of the Uzbek Service of Voice of America, who also was in Uzbekistan just recently. So I will give each of you the floor for 15 minutes and then we will open for Q&A session. So, Alisher, you don’t see us. You see just Sean and Navbahor, but we are all there. The room is full and I give you the floor now for your presentation. Thank you. Thank you so much. Dear ladies and gentlemen, I’m really humble to speak to you today, and thank you for showing interest in this subject. It’s indeed has been a very dynamic year for Uzbekistan since the death of iron-fisted authoritarian leader Islam Karimov, who ruled the country for over quarter of a century. So he could have gone on actually half of century, but didn’t. Newly elected, President Mirziyoyev had a trip to New York, where he addressed the UN General Assembly meeting. He said basically, that Central Asian cooperation is his top priority in foreign relations, and stressed his readiness for any compromise. Mirziyoyev outlined his main achievements: release of political prisoners, full currency convertibility, the best relations with neighboring countries ever, and rehabilitation of religious inmates. So basically, arguably, all of these points have some truth behind them. So it’s not false, all of them. But there were some concerns in regards of how he did his trip to New York. Basically, he traveled on Russian billionaire Alisher Usmanov’s plane. How would you react to it? How much conflict of interest do you see there? So that left us very puzzled. What’s the relationship? The puzzle is a different type of concerns. I mentioned conflict of interest, first of all. Then of course Russian influence. And possible security threats, that he might not even trust his own security that runs planes. Generally, Mirziyoyev tried hard, I think. There’s already so many jokes regarding his active movements. So he never sleeps or something. People are really kind of worried about it. So one day he appears in one region. At the same day, in the afternoon, somewhere else that he fires another district official. So basically he was running the country very manually over the whole year, and showing a lot of interference in every issue, I would say. Even the minor … He went into wedding parties. But on the other hand, he was in some way better than his predecessor and in some way showing more progressive moves. It’s very important to ask who is President Mirziyoyev, whom Uzbekistan had elected as his leader for the upcoming years, I would say. At least I could quote Mirziyoyev himself, saying that he came for years, to be there for years. And basically the guy was very patient. He was out of radar. He was a shadow mechanism of Karimov’s regime, patiently waiting for his turn and for the chance to become a president. So he never appeared on Uzbek television, never delivered any public speeches. And suddenly the whole agreement between Uzbek elites, Russian security, point that he would be the best candidate and they agreed on him internally, in the closed circles. However, there were rumors and speculations during the year that security services were not totally happy with him. And of course over the whole year we haven’t heard a single statement by Mirziyoyev or anything related with Uzbekistan National Security Service. So the status quo is, “Let me do everything. Let me be everywhere and interfere everywhere, even to the weddings.” But on important issue like National Security Service, that is the crucial … you keep silence. So for us, that was a big signal that he’s not under control, he’s not fully controlling the situation. His jumping on Usmanov’s, Russian billionaire’s plane was also very strange. It also accompanied the rumors that there were about possible security threats. So we don’t know everything, but that what we are hearing from the ground. The current situation is also very volatile. The Chairman of National Security of Uzbekistan, Rustam Inoyatov, is in hospital. He has the pharmaceutical poisoning. We have a very close person releasing his latest condition. The condition is medium-heavy state. So the pharmaceutical poisoning was caused by mixing two drugs… He started using a new pill for his diabetes, and that was incompatible with the old one. So that’s the delicate situation. We don’t know how he will come out of it. Would he recover from it or things will change? We don’t know whether Mirziyoyev will appoint someone who will be loyal to him. We have a couple of names for the possible replacement of Inoyatov, but that remains to be seen. So Uzbek National Security Service is a very big topic and it’s a most important topic because, as you know, during President Karimov’s time, they were everywhere and they were running the whole country, basically. Karimov was there but he was not controlling as he would want us to think about. So in many cases Mirziyoyev controlled the National Security Service over the year. In the case of lifting visa requirements for Western countries, he announced about it but then pulled back, apparently, because of security concerns. He also announced about the lifting of exit visa, visa regime, but it was also replaced by foreign passports. Also not a very free kind of system. Raises lots of concerns about how easily people will be getting those passports. He had made some changes in economy. He tried to convince the world that now is the time to invest in Uzbekistan. But it is very difficult shot after ongoing scandals with the leading companies, and the telecom, with the daughter of president Karimov. With so many investors being cheated over so many years, they try to soften the regime for foreign investors. They invited several Turkish investors who were previously driven out of Uzbekistan and their properties confiscated. They’ve offered them a new property, new thing, just to open up a little bit. But that seems not working very well. Now, the latest claim is that America and Uzbekistan signed contracts worth of 2.6 billion with the leading companies. That’s also need to be checked and double checked, I would say, because what are those contracts? Are those memorandums or real thing? It’s still very vague. And in the media yes, media became more open. A little bit open, with two steps forward, one step back. But the media starts talking about problems without criticizing those who caused that problems… Or attacking prosecutors for increasing the prices, for high prices. One of the TV shows, the recent one I had to watch, they start attacking the prosecutor’s office, because prices are going up. And the rhetoric is, why prosecutor’s office is not controlling prices? So that’s the base, you can touch on a daily basis on Uzbek television. But as I said, journalists, especially websites, they are more open and willing to cover issues. For the first time, they picked up our report yesterday about the death of a woman in the cotton field. Of course, they don’t refer to RFE/RL. But it’s big thing that they accepted this as a report. That’s basically it, the major concern, as I said, is Russia – Russian influence over the situation. Russian FSB is providing presidential guard to President Mirziyoyev. President Mirziyoyev dismissed all the previous presidential guard. The head of previous presidential guard, now, is now a head of customs committee. He’s not using former president’s compounds, offices, residences, his cars, his plane… Even in travels, he’s traveling a different road than President Karimov used to travel. Basically, he’s making as much as possible, to distance from the previous regime, and at the same time – given the fact that Karimov was so popular among people – he’s still referring to him as his father, while keeping his daughter in prison. It’s pretty crazy situation, I would say. The big thing, the new rising stars, the new Gurnaras and Lolas are Oybek and Otabek, his son-in-laws. Oybek is already started bringing his old friends from Russia, from the other world. Last week it was reported about the massive arrests in Tashkent among criminal underworld. Its post-Soviet underworld is a big factor in power. Controlling the streets, basically, is one of the things that president should be doing. The streets were not under Mirziyoyev’s control, and now gradually Oybek is leading that effort, bringing his old friends from Moscow, from Russia, with the links to Chechen groups, to Putin. Their friends, they’re also coming to businesses. So new business people appearing. So they are rising stars. Let’s see how fast they evolve into our beloved ladies, and it need to be seen, of course. And on the other hand, President Mirziyoyev controls his son-in-laws, and keeping them very close to him. So in the morning they travel to him to work, and come back from work all together. One of his son-in-law is his chief of his guards, like deputy but he’s the chief actually. And the second is responsible for the cabinet. All of his schedules, so the closest associate, I would say. So this are just the main outlines, but if there are more questions, I’m very happy to respond. Thank you so much, Alisher. That was really a wonderful insight into what is happening in the country. Now I would like to give the floor to Sean Roberts. Thank you. If my voice holds up, I’m going to be talking about prospects for change in Uzbekistan. And what I like to term it “Uzbekistan’s Revolution from Above”. First of all, it’s important to point out that there’s both expected and surprising things related to the succession of presidency in Uzbekistan. For years, analysts and experts have speculated about succession in Central Asia, particular, Kazakhstan and Uzbekistan, that have had both the longest-term presidents, and the most powerful personalities. The speculation has been varied. Some people expected some sort of Putin-esque appointment of a successor, previous to the president stepping down. Others suggested imminent chaos coming out of a succession. And I think the one that I had agreed with most of all was that you would likely see a smooth transition, and you would likely see somebody from the inner circle of Karimov’s administration take over, who would then maintain the status quo. So in some ways, that’s happened. In other ways, it hasn’t happened. So, it’s happened in the sense it was a smooth transition. Mirziyoyev was the long-term prime minister to Karimov. He was certainly the inner circle. It seemed to be very much an elite-managed transition. However, Mirziyoyev has not sought to maintain the status quo. In fact I would say that he’s systematically dismantling the system that Karimov built. And this is somewhat surprising. Now, I’m going explain some of the reasons I think that it’s worthwhile taking Mirziyoyev’s reform agenda at face value. But before doing that, I do want to point out why I call this a revolution from above. First of all, in April when I was in Tashkent, I went to one of these great corner stores that have beer on tap, and I sat with a guy who was an Uzbek who had worked in the EU for a while, and he’d just come back. And he said, “This is a revolution from above. This is the only way that Uzbekistan can change.” And I was kind of struck by that. Secondly, I think the concept of a revolution from above is interesting in the context of the former Soviet Union. We haven’t seen many states in the last decade, or fifteen – maybe 20 – years, in the former Soviet Union, undertake radical reforms from above. What we’ve seen are several revolutions from below, or what appear to be revolutions from below, where you had popular protest movements force change in places like Ukraine, Kyrgyzstan, and Georgia. As a scholar, I’m interested to watch how this unfolds, as a comparison down the road. What are the benefits to a very well-planned transition from above versus something that’s more spontaneous? And what might be some of the drawbacks to that? Now, I should note there’s some limits to this comparison. In many ways, what we’re seeing in Uzbekistan right now is a return to the 1990s. We’re seeing Uzbekistan go from 0 to 100 overnight, or trying to. And if the reforms are successful, it may just be that Uzbekistan gets to a point similar to what we saw in the Ukraine, Georgia, Kyrgyzstan prior to the revolutions that took place there. First of all, to understand what the changes are that the new president of Uzbekistan is implementing, it’s important to look at this five-pronged development strategy that he has published and made a big deal of within Uzbekistan, that’s aimed to make changes between 2017 and 2021. I’ll read out the five priority areas that he’s outlined. “Improvement of state and social construction”, which sounds like a very Soviet-esque idea. Most of the detail on that has to do with the liberalization of the political space. However on the other hand, some of that is somewhat murky in the details, which I think is important to point out. Secondly, “the rule of law and the furtherance of judicial reform”. And this is interesting that this is not part of the improvement of state and social construction. This is completely separate, and there’s lots of evidence that he’s pushing these reforms through very poorly. Third, “economic development and liberalization”. Four, “development of social services”. Five, a kind of catch-all, but I think actually very important area and priority, “security, inter-ethnic harmony, religious tolerance, and the implementation of balanced, mutually beneficial, and constructive foreign policy”. And this gets to something Alisher was talking about. The new administration is really pushing increased cooperation in Central Asia, and is trying to change Karimov’s foreign policy, which was quite closed in many ways. And furthermore, I should mention there’s also the case that Western liberal states increasingly don’t really care about liberalization in the developing world. Led by the Trump foreign policy, but also in Europe there’s kind of a movement away from the promotion of democratization in the emerging states. On the other hand, there’s real incentives for the government to want to reform. First of all, I think that … and my working hypothesis on this is that Mirziyoyev as a long-time prime minister having to implement Karimov’s policies, knew the problems that these policies were creating, and the potential dangers that they would present in the future. The first is Karimov’s oppressive regime created a substantial opposition abroad, many of whom have joined extremist groups over the years. I think it’s really a case where the government has spawned it’s own extremist opposition. And a lot of them are now fighting in Syria. There’s a question, will they want to come back home? If the status quo remains in Uzbekistan, will they focus on this? So, this explains a lot of why Mirziyoyev is really trying to soften the government’s stance on religion, among other things. Second, Karimov’s economic system was really unsustainable, particularly in the context of Uzbekistan’s youth bulge. And this seems really clear, that the Uzbek government understands this and wants to change this, because they’re very much focused on bringing in foreign investment. They understand that they need to have jobs for the next generation. Obviously, we already see the number of Uzbek citizens who are migrant laborers abroad, and I think it’s rational that the government wants to reverse that situation, and begin to create economic opportunity locally. I won’t go too much into the demonstrations of the political will to reform, but as Alisher mentioned, there has been real change in foreign policy. I think a lot of analysts were pooh-poohing the government’s political will to take care of currency convertibility. They seem to be going pretty full force ahead on that. There’s still time, we’ll see whether it is fully implemented, but I got the sense, talking to people in the Ministry of Finance for example, that they completely understood that there’s no way they can bring foreign investment in the country if there’s not convertibility. Particularly if you want that foreign investment producing things for the local market, because otherwise they can’t convert that money back into hard currency. Also, there’s definitely been a certain thawing in terms of political prisoners. I think it hasn’t been fully realized, but we’re seeing some of that. As I mentioned, there’s some more leniency to pious Muslims. There’s review of all people who were imprisoned for extremism. And Uzbekistan accepted a delegation from Human Rights Watch to come to the country, which was the first in a long time. So there’s certainly some demonstration of things happening. On the other hand, there’s not really a serious movement on building the institutions needed for a liberal democracy. Now, there’s different ways to interpret that, but it seems that that’s not the top priority at this point. So what does that mean the government’s really reforming to? Is it trying to reform to a liberal democracy? Or is it trying to reform to a more managed democracy, softer authoritarian structure like you see perhaps in Kazakhstan, in Russia, Azerbaijan. All logic would point to the latter. It makes a lot more sense looking at the region, certainly if there’s increased ties with Russia. Still, if that was to happen that would be a revolution compared to what we had just a year ago. So I think that there’s a lot to be said for those changes. Now, the one caveat, it is possible – and it interests me as somebody interested in democratization – that the Uzbek government wants to get rule of law right first before implementing any kind of political liberalization. If that is the case, it would be very interesting to see how that plays out, because we know in countries like Ukraine, Georgia, and Kyrgyzstan, where you have political democracy in many ways, the rule of law is the weak point, and it leads to massive corruption, to a decline in politics, and so on. Finally, to get to the big question, which Alisher has taken most of us already, is, are these reforms sustainable? If they’re serious, if we’re going to say that we should take them at face value, can they be realized? And the big question really, I think, beyond … There’s a question of capacity – if the government can actually get all these things done. But beyond that, there’s also this question of, are there real opponents to reform within the higher echelons of the Uzbek elite? And it would seem logical that there would be. The national security service is the first one that comes to mind, and as Alisher has already mentioned, there’s lots of speculation about whether the national security service has pushed back on certain reforms. There’s even a couple of rumors going around of attempts to assassinate Mirziyoyev on his trips abroad by the national security service, and this also is connected to the Usmanov plane rumor, and so on. Whether those are real, or just rumors, it shows you that a lot of people are concerned about this relationship between the security organs and the new presidential administration. Secondly, state-owned enterprises. I didn’t realize, until I started to look at this, how powerful these organizations are. Uzbek Airways, Uzbek Railway, they own much more than the airlines and the railways. They own all kinds of different enterprises within the country. Obviously to them, the economic liberalization, bringing in foreign investors, is going to be a certain threat. So how much are they going to push back? Finally, Uzbekistan is famously opaque. We don’t know exactly who within the elite control the black market for currency exchange, but there were some people making a lot of money off of that. So if they bring in full convertibility, that’s going to reduce a serious revenue stream for certain people. Obviously that could be something that is problematic. I just want to end my talk on one point. If we take the Mirziyoyev regime, administration, at face value of really wanted to reform the country, and we assume that there are serious opponents to these reforms within the elite, within the old guard, how can those people interested in realizing the reform succeed? A lot of people have been saying, “You know, he has to consolidate power.” And the route that the president seems to have been taking to consolidating power, interestingly, has been by trying to win popular support. From the very outset he was setting up these … that he called the virtual cabinet, where people could report issues that they had on the street, and corruption from government agencies and so on. He would try to order the people in the government to take care of these issues for people. So that’s one thing he’s trying to do. The question that stands out to me, is whether he needs to actually liberalize the political space to a certain extent, to really consolidate his power. Because if you just work on populism alone, that can’t really bolster your power. But if you were able to actually have a structure where there were more independent NGOs, media, even perhaps a liberalization of the political party system, would that … and you have people within those kinds of institutions supporting his reform agenda, that could have real positive impact in terms of realizing the things that he’s trying to get done. So I’ll leave it at that. You’re welcome to ask any questions. Thank you so much, Sean, for this great presentation. I propose we keep the questions at the end, and now we’d like to give the floor to Navbahor, so we can continue the discussion. Thank you so much. It’s wonderful to be here. That was his new security, who kept you away? No, not necessarily the security, per se, it’s the group of people. Let’s just call it the Uzbek government. We were in the business forum yesterday morning, for example. We had access to some events, but in general … I wanted to interview the president, right? I thought that if he is this guy who seems to be so open and so willing to talk, let’s talk. He has not given any interviews, and I thought this would be a really good opportunity for him to chat, at least give a comment to Uzbek language media, inside Uzbekistan. So that didn’t happen. But, the bigger picture is that this is still a very nervous, careful, and to a great extent, authoritarian regime that we have. I was in Uzbekistan in July – August. And I have been to the country two years ago, and every time I travel to Uzbekistan, I actually travel not as a journalist, but as an Uzbek citizen, and this is why, whenever I say here will really be my own views, because I’ve never traveled to Uzbekistan as a Voice of America journalist, and we don’t do any work from inside the country. What I saw this time was this incredible high morale. You could actually sense the positive energy in the country. The way people were willing to talk, to share their thoughts, the way people feel connected to the government – whatever they see as the government – and the vibrant media environment, the open conversations … I was trying to be as discreet as possible – because again I’m traveling as a private person – the amount of people who were reaching out to talk, to bring stories from within the system, from the non-governmental community, from different walks of life. And people were really excited about what’s happening in the country. And to me that’s one of Mirziyoyev’s accomplishments, actually. It’d really be very naïve for us to say that all these changes started happening after Mirziyoyev came to power. That would actually be really inaccurate, and I think the country was never stagnant, we knew it. The country was evolving, not in the pace that a lot of us wanted to see, but in a way that any country was because of the various factors, right? The fact that you have millions of Uzbek citizens abroad, the country has never been connected to the world this much. It was becoming incredibly difficult for the Karimov regime to control the flow of information, to control the movement, and so what happened was this incredible transformation of Prime Minister Mirziyoyev into President Mirziyoyev, I think there is so much there to analyze, so much to study. I think that’s fascinating, because many of us did not expect that if Mirziyoyev became president of Uzbekistan, he would be like this. So is he in control of the country? I think he is, but I think in a very different way than Karimov, he’s also delegating responsibility in the eyes of the public, which I think is giving enormous responsibility to those who are in lower levels. So the people of Uzbekistan, I would say – which is really good news – are finally getting to know who their leaders are. You have President Mirziyoyev, you can blame him for a lot of things, but then there is a district mayor. There is a regional governor. There are people in between who you should know, and who you should go to to resolve your issues. So in that sense, this virtual cabinet that you were mentioning has been such a dramatic push, everybody’s talking about that portal. There is so much discussion of politics, Uzbek politics, that we used to not really even make any reference to. This is only observations, so obviously I’m devil’s advocate, I have my own personal analysis of this, and this, and I can ask a gazillion questions. But if you were to look at the bigger picture, it was happening in the country, people seem to be very inspired by the new president, and there’s this realization – which is very timely – which basically says, “You know what? He’s leading us. The real work will be done by us. This is our issue, and maybe we finally have a person who will let us run our own destiny.” It’s not like the Uzbeks lived on a different planet, and did not think that they were never in control of their own destiny. But now there is this feeling that he will let us run our own path, and he will support us. But from Mirziyoyev’s perspective, what I saw was, he knows that the hunger for change is obvious, he cannot control that. And he’s determined to channel that energy toward a direction that he wants, and he wants to lead, and he wants to increase his political, social, and possibly financial capital. Through this process, I think he also wants to consolidate power, and I think he’s genuine in saying that through this strategy, he wants to move the country forward. So he wants to consolidate power. He wants to stay, he wants to make sure that he’s the most powerful person in the country. But as he does this, he also wants to move the country forward. And that is a very difficult process, and I think it’s going to be very difficult, because the fundamental challenges in Uzbekistan are still the same. It’s the authoritarian nature of the regime, the fact that the education system has degraded to a great extent, the healthcare system has degraded to a great extent. And that the extent of the security service, this monster – right, sometimes people refer as, and Alisher was so right in pointing out, that security services have infiltrated every walk of life. That is still the problem, and then you have corruption. In every corner of Uzbek society, you have the criminal business elite, what are you going to do with them? They control so much, and corruption is so widespread. And Mirziyoyev will definitely face pushback if the elite starts to lose money and status. I think that’s really, really important. Whoever I talk to in Uzbekistan seems to acknowledge that fact, that this human capital that we used to brag about in Uzbekistan, these great professionals we have … they are no longer there. So there is this acknowledgement that the country needs to move forward. There is a lot of work to be done, and no matter how happy or disappointed we’ll be with President Mirziyoyev, there is so much work ahead. And do we have the right people? We should. There has been so much chaos in terms of running the state broadcasting system. Do we have the right people to run? Who should run? How should we manage this system? I think those conversations being carried out openly … This is promise. So I came back from Uzbekistan basically thinking that, “Oh my god.” Be careful of what you wish for, right? There is so much to do, or to think about, if you are an Uzbek living abroad. Is this opening good enough for me to start thinking of what I can do for my country. And if you’re inside the country, what is the next step? People seem to be empowered, and as I was saying earlier, people are getting to know their leaders. There is so much political discussion on TV. You can easily get bored too, because they’re one hour, two hour discussions. They were being carried out live for a while, and that ended now for a while, and now where they are debating new beginning of those live shows. This thing about how, “oh my god, Uzbeks cannot handle live television”, that discussion is over. Uzbeks can do more than handle live television. They’re finally getting to talk to each other. They’re finally getting to hear each other. People finally seem to be talking about leaders other than president. Their deputats, their lawmakers, the district mayor. And through this virtual cabinet, where they get the letters back from president’s office, the letters in detail basically say what to do. You go to your district office, there is this guy who is in charge of this issue, you go and talk to him and this person should resolve your problem. So, people feel very empowered to go and resolve their issues, because it’s they have this proof, right, that government is taking care of them. All of that is selling really well for President Mirziyoyev, in general. What will happen? What is his deadline? It’s very hard to talk about it. Because nothing is unconditional, right? But I think there is so much pressure on President Mirziyoyev now, now that he’s also spoken from an international arena, and I think he went home very happy, from the meetings and the conversations that he had in New York. But I’m sure he’s also realizing that this build-up of pressure is really on him, because the world is watching, and if there’s this new Uzbekistan, they have to see it, right? There is a lot more to say, but I hope that we can talk about later.